Climate change (or global warming) is happening for real and its happening very fast. This is a wakeup call for all of us to work towards reducing the carbon footprints. As per NASA, the temperature of the earth’s surface has risen by 1.62 degrees since the late 19th century; this has occurred primarily due to increased carbon dioxide and other industrial emissions into the atmosphere. The CO2 concentration in the atmosphere is growing at a high rate. The Mauna Loa Observatory in Hawaii has been keeping track of atmospheric CO2 concentration since the year 1958, and as per them, the carbon dioxide concentration had already reached 407ppm in 2016 from 316ppm in 1958. Climate change is going to affect life on earth adversely if all of us don’t start contributing towards reducing our carbon footprints. All the industries need to innovate and find options that are more environment-friendly. The significant steps that a brand can take to reduce the carbon footprints are – reducing the industrial emissions into the environment, switching to eco-friendly/recyclable packaging, and going digital. 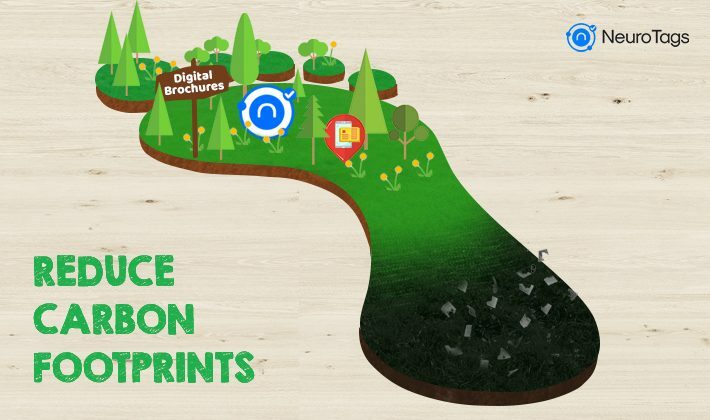 Brands can reduce their carbon footprints considerably by going digital. Going digital means going paperless wherever possible. Many brands have started taking steps in this direction. It includes the use of thinner labels, switching to minimal and bio-degradable packaging. A lot of paper is used in product brochures and leaflets which most of the times gets misplaced or ends up in the dustbin. Brands can switch to e-brochures, e-warranty to further save the paper. Shifting to digital versions of brochures and warranty cards also make them easily accessible in the time of need. NeuroTags offers algorithmically coupled digital tags that can help brands to cut the paper usage in product brochures and leaflets. The brands can apply the digital tags to their products. When a user scans the tag, they can read the product brochure on their smartphone/tablet. Similarly, they can also register/claim for warranty, gain loyalty points on the same tag scan. By scanning this tag, the buyer can also ensure that they own a genuine product. Digital warranty cards are a lot easier to access in the time of need instead of the physical ones which customers usually tend to misplace and forget. Providing digital forms of brochures/instructions can also make it easier for users to use the products and help them save lots of time as they can simply scan the tag on the product and read instructions or see product usage videos immediately instead of finding the physical manual or spending time on Google engine to find the relevant information.